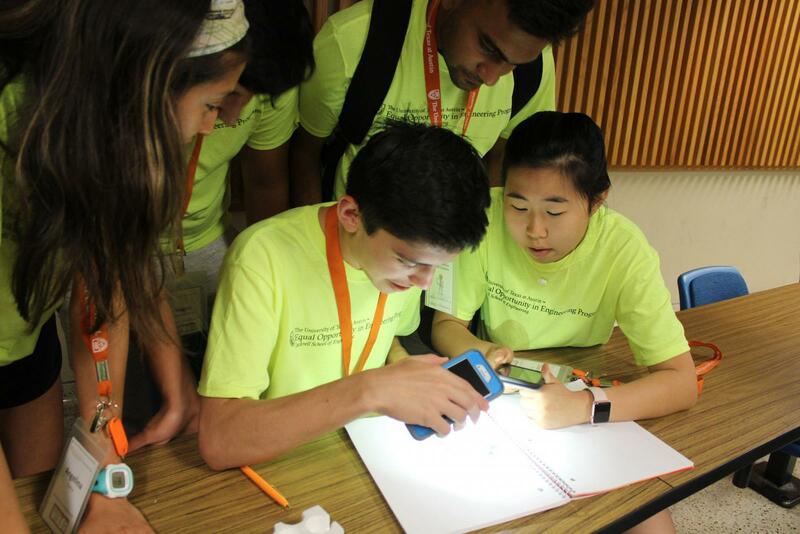 EOE recruitment efforts include summer enrichment programs and one-day events designed to interest and inform underrepresented prospective students about engineering at The University of Texas at Austin. In addition to our dedicated events and programs, student groups Pi Sigma Pi Minority Academic Society, the National Society of Black Engineers and the Society of Hispanic Professional Engineers partner with middle schools to introduce STEM fields to young students. Longhorn Engineering is a free, campus visit for underrepresented high school students interested in learning how engineering shapes our world. YOUatUT is a one day pre-college event for high school students (rising 9th-12th grade students) interested in exploring the different engineering fields that The University of Texas at Austin has to offer. My Introduction to Engineering (MITE) is a five-day camp for current high school juniors to discover engineering through participation in an engineering team project, hands-on activities and interactions with engineering students, faculty, staff and alumni.